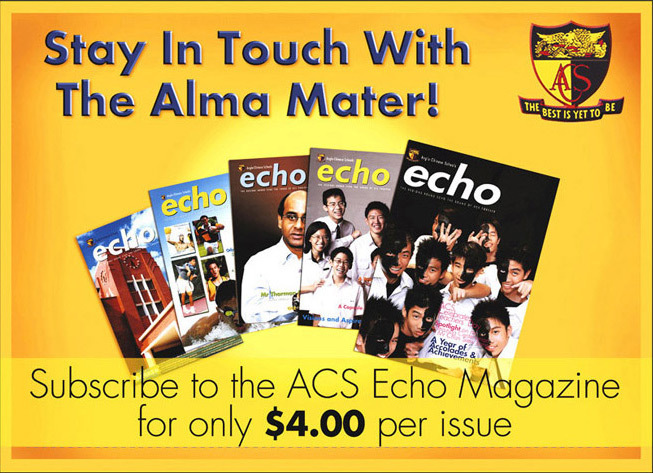 The ACS Board of Governors publishes the ECHO four times a year. It is circulated to students of the five Anglo-Chinese Schools and is read by students, their parents, teachers and old boys. Its editorial makes interesting reading and contains a wide range of informative, educational and enriching topics including the schools' academic and sporting achievements. The Echo has a special section that is solely devoted to alumni news, which keep old boys in touch with each other and with their alma mater. It is a great medium for bonding students, parents, teachers and members of the ACS community together. Subscription for the ECHO is only $16 for four issues per annun (including postage for Singapore addresses). Read all about the latest happenings in the ACS family of schools and be proud to be an ACSian! Enclosed, please find my cheque for $16, payable to Blue Skies Communications being payment for 4 issues of the ACS ECHO magazine.